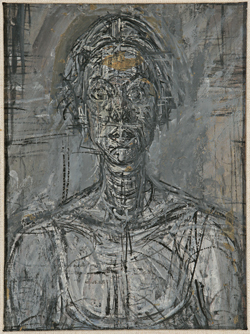 Bust of Annette is among more than 60 works by the 20th century Swiss artist Alberto Giacometti on display at the National Portrait Gallery in an exhibition which opened earlier this month. The first ever exhibition to consist solely of portraits by Giacometti (1901-66), Giacometti: Pure Presence features paintings, drawings and sculptures from across his entire career. While he is most famous for his tall, thin standing or walking figures – works which fueled his reputation as a leading surrealist sculptor, the exhibition focuses on his life-long preoccupation with portraiture. Apart from his wife Annette, subjects featured in his works include his brother Diego, friends such as the writers Louis Aragon and Jean Genet, retailer and philanthropist Lord Sainsbury, art writer James Lord, Isabel Nichol – who later become Francis Bacon’s muse, Isabel Rawsthorne, and a prostitute named Caroline with whom he worked for five years from 1960. Highlights of the exhibition include a portrait bust of his brother Diego created in 1914 when the artist was just 13, an Egyptian-inspired sculpture of Isabel’s head and his celebrated work, Women of Venice VIII, which stands at the centre of the exhibition. The exhibition, at the gallery just off Trafalgar Square, runs until 10th January. Admission charge applies. For more, see www.npg.org.uk. PICTURE: Bust of Annette by Alberto Giacometti, 1954 Private Collection/© The Estate of Alberto Giacometti (Fondation Giacometti, Paris and ADAGP, Paris) 2015.